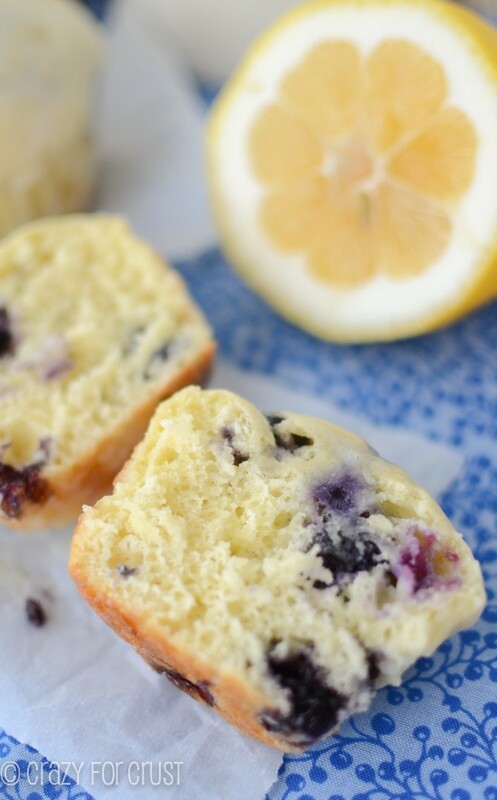 These Lemon Blueberry Muffins are perfect for an on-the-go breakfast! Or you can serve them at brunch, with a white chocolate glaze! I found that funny, since she refuses to eat them. They have “big” blueberries in them. “Big” meaning, you know, regular ones. Jordan prefers the blueberries that come in the can in the box of blueberry muffin mix or, even better, the blueberry muffin mixes you just add water to. After I got that email, I realized I had not shared these muffins with you. 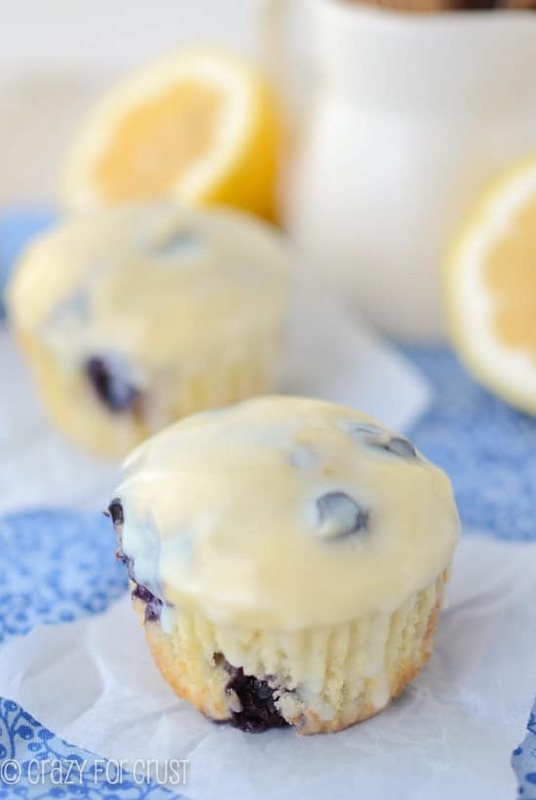 These Lemon Blueberry Muffins are actually the recipe I based my Fruity Pebbles Muffins off of, except these have lemon and blueberry. And did I mention the white chocolate glaze? That’s what sets these babies apart, I promise you that. 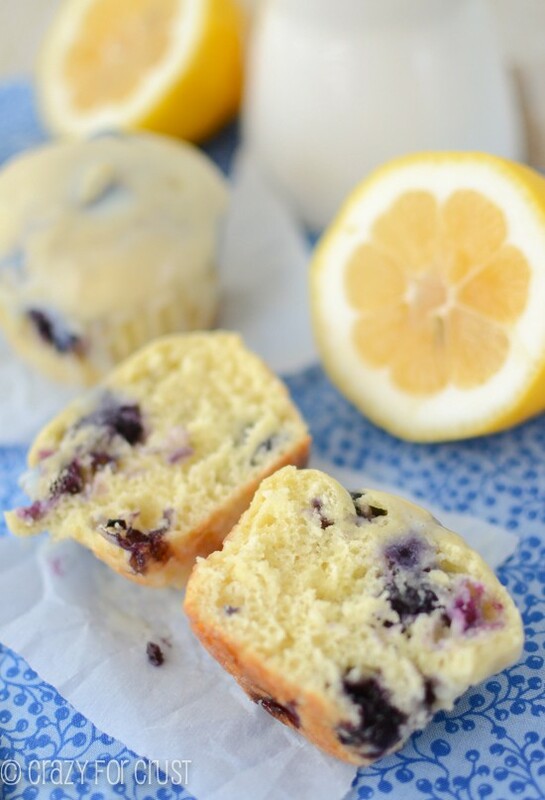 When I think blueberry the first thing I think is lemon. When I think lemon, the first thing I think is white chocolate. 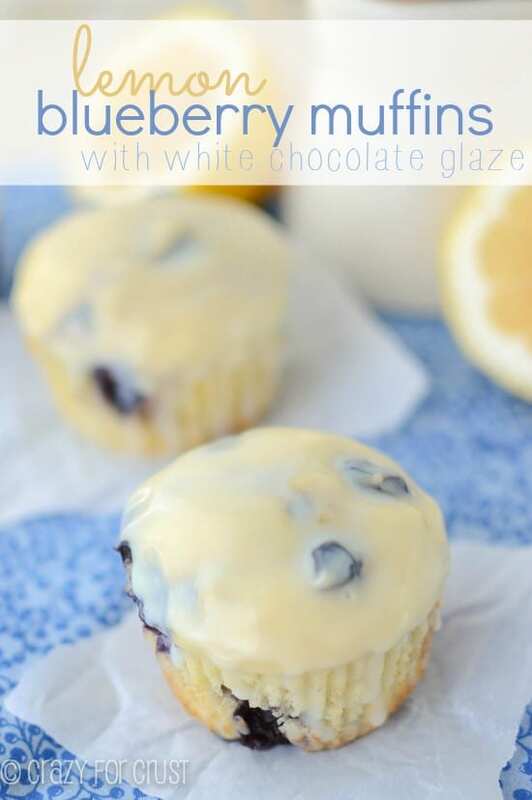 So Lemon + Blueberry + White Chocolate must be good, right? These muffins are based on my mom’s blueberry muffin recipe. I grew up with these babies. I’d wake up on a Saturday and smell something good, and my mom would be in the kitchen making muffins for breakfast. Those were the best weekends! And then the piece de resistance…the glaze. White chocolate is melted with some heavy cream to create a ganache. When ready to serve, dip the muffins in the ganache. 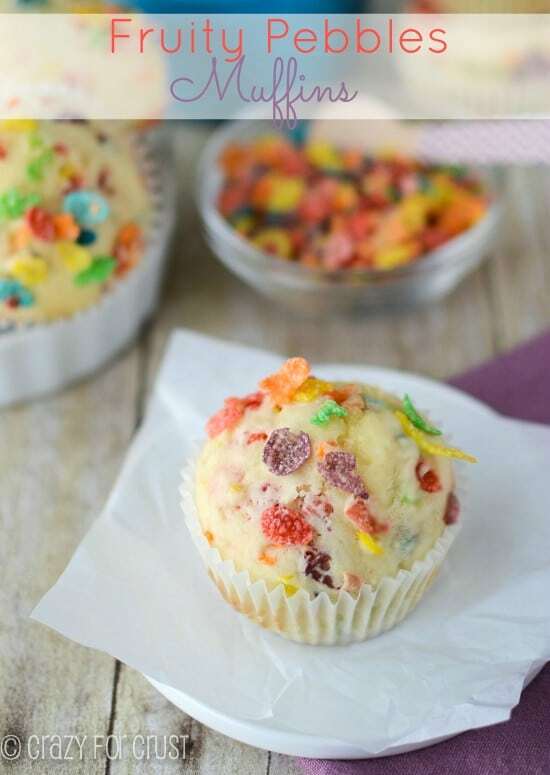 It’l run down the sides and add the perfect touch of sweetness and glamour to the muffins. I mean, it’s ganache. Other option: drink with straw. I ganached have the muffins, but left the others plain. For a quick breakfast before school, plain is good. For a wow on a weekend – just add ganache! Preheat oven to 350 degrees. Line muffin tins with liners. (Makes about 24.) Spray them with cooking spray to avoid sticking to the paper. Whisk eggs, yogurt, and oil until no lumps remain. Stir in sugar, lemon, and lemon zest. Stir in baking powder and salt. Add half the flour and half the milk, stir to just combine. Add remaining flour and milk and stir until just combined. Carefully fold in blueberries. While the muffins are cooking and cooling, add white chocolate and heavy cream to a microwave safe bowl. Heat for 30 seconds, then whisk. Heat for up to 30 more seconds, until you can whisk together and the chocolate melts into the cream. Let cool for about 30 minutes. When ready to serve, dip the tops of the muffins in the glaze. Glaze is optional, but good! These are awful. As stated by a previous commenter the ratio of flour to other ingredients is off by an absurd margin. Pls stop gushing over the idea ladies and try the recipe. Complete failure. I’m sorry you don’t like them! I’ve made the recipe (different variations) several times, and it’s one I grew up on. The batter is very thick, and the yogurt changes the texture a lot. With all oil, they taste more traditional. Would love to make these for a get-away this weekend. What is their shelf life? I’m guessing they don’t last long once they are made but I’d like to make these for Sunday breakfast…can I bake them Friday and keep them refreidgerated until eating? Thank you! I just made these muffins and I’m not so satisfied with the outcome! First of all they taste raw no matter how long you cook them! And they are not sweet enough! I’m sorry you didn’t like them! I didn’t have a problem with the cooking, they are chewier because of the greek yogurt. Could that be the problem in that respect? The sweetness…well, I guess that’s personal preference. Did you use the glaze? I would prefer to use oil instead of greek yogurt… how much do I use?? 1/2 cup should be good. 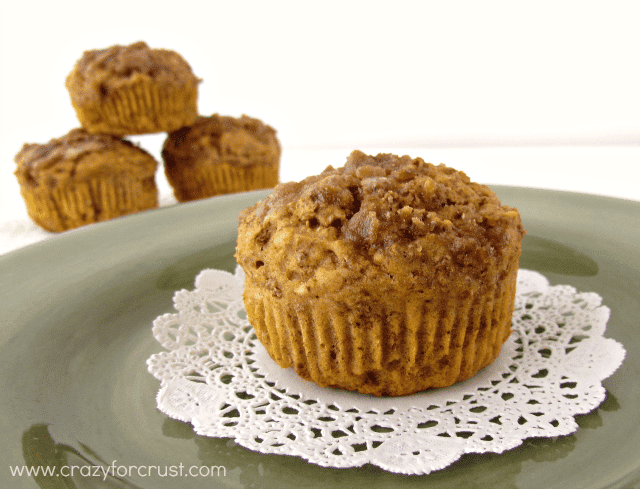 Note that the recipe makes dense muffins. That’s how I grew up on them, but you can reduce the flour if you don’t like really dense muffins! Pingback: 50 Citrus Desserts - Chocolate Chocolate and More! I was already making these when I started to read the comments and I’ll admit, I was a little nervous. I was already skeptical of 4 1/2 cups of flour, but the pictures sold me on trying it anyway. The batter seemed thick and difficult to work with, and I added an extra splash of milk to help fold in the blueberries. However, I was delightfully surprised with how they looked when I peeked at them after only about 10 minutes. I took mine out around 17 minutes, too – they are delicious! I am about to glaze them now but they were good all by themselves. They will be a wonderful addition to my Mother’s Day brunch tomorrow. Thanks! Hi! I would really really love to try this gorgeous recipe but am a little reluctant on using cups for measurements as cup sizes vary in different places. Can I please know how many mls your 1 cup is? I can convert it from there. Thank you so much! I’m not sure how many mls it is – it’s a standard U.S. 1 cup measure (liquid – 8ounces).